Just a quickie before I head out for a training session. Another quick and easy recipe! 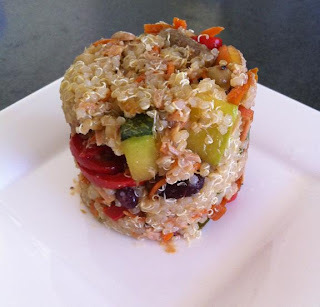 Quinoa tuna bean salad with grilled veggies, drzzled with balsamic vinegar and olive oil. Create a broth using the dried anchovies - you can use chicken stock, vegetable stock, beef stock, etc I've decided to create an anchovy broth as my protein is seafood. Cook the quinoa seeds in the broth - 1 part quinoa seeds to 3 part broth. Bring to a boil and then let it simmer for 15mins with the lid on. Grill your vegetables on a non stick pan - I've used red and green capsicum, zucchini, mushrooms and carrots. Step 4. Combine the tuna, beans, grilled vegetables and quinoa. Then drizzle with balsamic vinegar and olive oil.